Gaming and snacking go (literally) hand in hand. So to increase purchases of Doritos and Mountain Dew among millennial “hyperlifers,” 94% of whom play video games for an average of nine hours a week, Frito-Lay, PepsiCo, and agency The Marketing Arm tied a promotion to the 2013 launch of Xbox One, perhaps the most coveted item of the holiday season among their target market. The Every 2 Minutes campaign gave gamers a chance to get their hands on an Xbox One. The first salvo was hurled at PAX Prime, North America’s largest gaming event, where fans could bid in a live auction for some of the first Xbox Ones to be released. 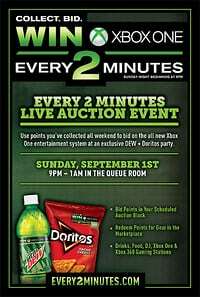 Bringing the action to the web, they launched every2minutes.com, a site where gamers competed against each other in online auctions of the entertainment systems. Codes found within specially marked packages of Doritos and Mountain Dew were the currency, which, of course, encouraged sales. In stores, joint purchases of the products earned consumers bonus points. What’s more, an exclusive deal with Amazon.com gave those who bought a bundle of four large Doritos bags a special bid-booster code. Consumers could use their coded points not only to bid on Xbox Ones but also to acquire a multitude of gaming accessories and related items or to enter drawings for a console—a way to allow lower-volume consumers to stay engaged. The campaign included several offline opportunities to score an Xbox One. For instance, a console placed at the bottom of a shark tank in a Florida aquarium was free to whoever retrieved it first. These challenges contributed to the media coverage beyond gamer outlets; in all, more than 3,300 media outlets picked up on the campaign, and the offline challenges garnered more than 14 million YouTube views. 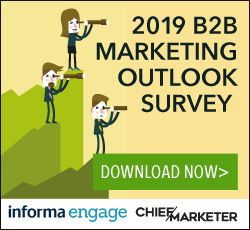 More than 4.7 million unique visitors logged into every2minutes.com, and it’s safe to say many did so while sipping on a Mountain Dew or crunching some Doritos: Sales of the former climbed 39% from the previous year, while sales of the latter rose 11%.